(Newser) – A Hall of Fame wrestler was arrested today and charged with murder 32 years after his mistress was found beaten and unresponsive in a Pennsylvania hotel room, the AP reports. In 1983, Jimmy "Superfly" Snuka, one of the World Wrestling Federation's biggest stars, returned to his hotel room after an event to find 23-year-old Nancy Argentino "gasping for air and oozing yellow fluid from her mouth and nose," according to the Allentown Morning Call. Argentino died the next day, and an autopsy report, which classified the death as a homicide, stated she had brain injuries and scores of cuts and bruises all over her body. 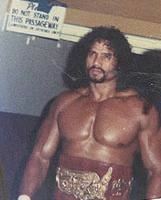 Despite Snuka being the only person of interest in the case, he was never charged. HER death ruined HIS life? Hmm, I'm pretty sure her life was ruined more, Snuka. But what's most surprising is that a WWF wrestler is still alive at 72. Statistically, he should have had a fatal heart attack 20-30 years ago. Maybe he slapped her around some but oozing yellow fluid is a sign of a drug OD. That's how they found Chris Farley.